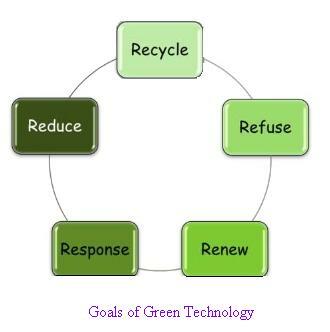 This page covers advantages and disadvantages of Green Technology.It mentions Green Technology advantages or benefits and Green Technology disadvantages or challenges. The technology which builds products and systems to help in conserving natural resources and environment is known as green technology. It is technology which is environment friendly and hence known as environmental technology or clean technology. It uses innovative methods to create environmental friendly products. The need of green technology arises due to the fact that natural resources are declining and pollution has increased due to abundant use of non renewable sources. Products, systems or equipments based on green technology satisfy following features or characteristics. • It should reduce or minimize degradation of natural environment around us. • It should have zero or minimum emission of green house gases. • It should be safe to use and should promote healthy environment for all the forms of life including humans, birds, animals etc. • It should help in conservation of energy as well as natural resources such as solar, water, wind etc. • It should promote use of re-newable resources. The figure-1 mentions goals or functions of green technology. They are reduce (fuels, waste, energy consumption etc. ), recycling (of paper, plastic, can, batteries, clothing etc.) , renewing (renewing energy such as wind power, water power, solar energy, bio-fuel, waste water etc. ), Refuse (the use of plastic bags) and responsibility. • Do not waste electricity i.e. switch off electrical equipment when not needed. • Do not waste water i.e. never leave taps open while brushing teeth or washing plates. • Do not waste fuel. • Do not waste food. The major applications of green technology include following. ➨It does not emit anything harmful for the environment. ➨It has become popular as consumers of the technology are becoming more environment conscious. This will give benefits to investors at long run in certain areas. ➨It requires less cost for maintenance. This reduces operating cost and hence overall cost on the long run. ➨As it uses renewable natural resources and hence we will never run out of vital resources such as water and electricity. ➨It will slow down effects of global warming due to reduction in CO2 emissions. ➨Initial investment or implementation cost is very high. ➨People are still not familiar with the technology and hence will take time to adopt it for larger population. ➨The technology is still evolving and many of the products are at R&D stage. Hence people are unaware of performance results. ➨Lack of skilled human resources are available to install or implement the green technology based products or systems. ➨In most of the countries policies have not been finalized for the green technology based systems.